Weinberg sophomore Charles Auta is one of seven active members in MGC fraternity Sigma Lambda Beta. Auta said that although a small chapter size means each member must take on most responsibility, it has also allowed him to form closer bonds with his fraternity brothers. As a Fall Quarter freshman, Genesis Garcia didn’t even know multicultural Greek life existed. It wasn’t until the Communication junior met members of Sigma Lambda Gamma and learned about the Multicultural Greek Council that she said she became aware of opportunities to participate in Greek life that departed from what was portrayed in movies. However, Garcia said she is aware that most people do not know the council exists due to its lack of visibility on campus. There were 107 students in MGC chapters last spring. When Garcia tells people she is a member of Sigma Lambda Gamma, she is often asked where it is in the sorority quad, she said. Several students of color described their experiences in MGC and National Pan-Hellenic Council and said it’s difficult to overcome some of the challenges in the university’s Greek system, including a lack of space and low membership. In September, a University task force released a 149-page report on the black student experience at Northwestern and recommended the University provide more support for NPHC and MGC. The report found that black students felt “isolated and even sometimes shunned” by the predominantly white fraternity and sorority community at NU. Travis Martin, Office of Fraternity and Sorority Life director, said the office is using findings from the Black Student Experience report to shape OFSL’s projects. The office is currently hosting a series of community meetings with members from MGC, NPHC, Interfraternity Council and Panhellenic Association to discuss what the findings from the report mean for the Greek community, said Martin, who started his position earlier this quarter. In addition to the meetings, new members in all councils will be required to participate in an education program in conjunction with the Social Justice Education staff, he said. “We definitely need to figure out a way to have a balance in how we’re supporting, continuing to support (Greek councils), but also recognizing the real needs that come from this Black Student Experience report,” Martin said. The report said black students’ dissatisfaction is “directly linked” to the lack of physical space dedicated to black social and Greek life. Weinberg junior Daniella Lumpkin, president of Zeta Phi Beta sorority, an NPHC chapter, said lack of physical space is one of the problems that frustrates her most. Because NPHC does not have on-campus housing or any official space on campus, meetings are held in student apartments and often require more work to plan and organize. In the report, black students — both Greek and unaffiliated — questioned why NPHC and MGC chapters do not have housing on campus like IFC and PHA. Martin said IFC and PHA pay leases on the houses they maintain on campus. Due to differing membership numbers and dues, he said NPHC and MGC don’t necessarily have the same resources as IFC and PHA to pay for on-campus housing. Lumpkin said OFSL and NPHC had taken steps last year to establish a physical space for NPHC, but nothing was made official. Martin said plans to create spaces for the two councils on campus are still open, but they are contingent on identifying funding for such projects. MGC president Suzy Kim, a SESP senior, said efforts to make changes for both NPHC and MGC have been hindered because neither council has had a stable adviser. Kim said graduate assistants who serve as advisers don’t typically have the same time to serve as full-time staffers. The current MGC adviser is a graduate student who previously joined an MGC chapter, which has improved the quality of the advising, Kim added. Martin said graduate assistants who serve as primary advisers for Greek councils work in conjunction with full-time staff members. This year, Martin said MGC’s adviser, a graduate assistant, receives support from him and an assistant director. 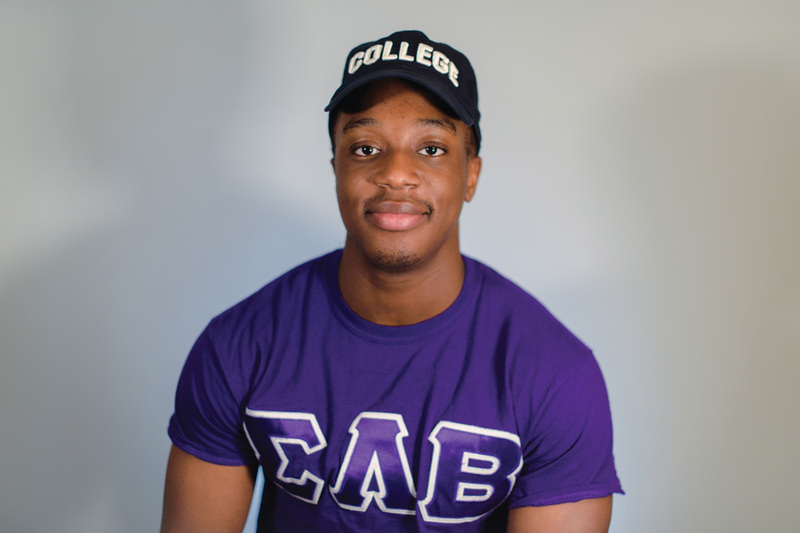 Martin now advises NPHC and said he will use his experience advising NPHC and MGC at the University of Georgia, as well as his membership in an NPHC fraternity to assist the organization. Lumpkin said another challenge NPHC faces is a lack of members. Last spring, 3,006 NU students were in Greek life, according to a membership and academic report. The report said IFC totaled 1,402 members and PHA had 1,460 members. In comparison, NPHC totaled 37 members, and MGC had 107 members. About 38 percent of NU’s student body is involved in Greek life, according to the Black Student Experience report. Of those students, less than 3 percent –– 76 students –– identify as African American or black. Less than 13 percent identify as Asian or Pacific Islander, and less than 12 percent identify as Hispanic. Sixty-two percent identify as white. SESP junior Rodney Orr, president of IFC fraternity Delta Tau Delta and incoming president of IFC, said he is “very aware” that NU’s Greek community is not diverse enough. Although his family members joined multicultural Greek organizations, Orr said he joined Delt because it was where he felt comfortable. Still, he said there have been moments when he has struggled in IFC. The report said although some black students are involved in Greek life, others feel excluded from it. Lumpkin said one solution to the lack of members in NPHC is to increase the number of black students admitted to the university — another recommendation included in the Black Student Experience report. More black students would not only increase the pool of potential new members but would strengthen NU’s black community, she said. Because each council’s budget differs based on its collected dues, the size of NPHC and MGC leads to less money in their accounts compared to larger Greek councils like PHA and IFC, Martin said. Martin said IFC and PHA have higher membership and higher membership fees compared to NPHC and MGC. Last year, Martin said, OFSL redesigned its budget and designated funds from the office’s general budget to better support NPHC and MGC. A smaller chapter also results in fewer hands to help plan programming and events, Lumpkin said. As a result, most of the tasks for her own chapter fall on her shoulders, she added. Garcia, the Sigma Lambda Gamma member, said some members of her chapter hold multiple leadership positions because the chapter is so small. “Obviously we always think about quality over quantity but at the same time … with the small numbers, we face logistical challenges with who can get things done,” Garcia said. Weinberg sophomore Charles Auta, a member of MGC fraternity Sigma Lambda Beta, said his chapter currently has seven active members. He said because NPHC and MGC have fewer people, each member must take on more responsibility. However, Auta said, he views his chapter’s small size as a positive. Kim, the MGC president, said since her freshman year, it seems as though PHA has done its recruitment following the same general format: a kickoff event and preview in the fall, followed by recruitment Winter Quarter. For MGC, she said the recruitment process has differed every year because the council is still trying to figure out what works. As MGC works to build new infrastructure within the council, it faces numerous hurdles simply because no consistent precedent exists, Kim said. “We’re the ones in the position to make good changes for our community, and it’s really just trial and error — learning what works, what doesn’t work, what can’t work and then ultimately what does,” Kim said. In addition to creating new systems, the upcoming challenge for NPHC and MGC will be to change the perceptions people have of their organizations. Kim said when students think and talk about Greek life, they often only consider IFC and PHA. People view IFC and PHA to be on a different “level” than MGC and NPHC, she said. She said the next step is to raise awareness of all four councils. One way to achieve this goal is to put on a kick off event that features all four councils on the same day, something Kim said she is hopeful will happen next year. Kim said solutions to the issues are a constant topic of conversation and added that she is curious to see how future council leaders will approach them.